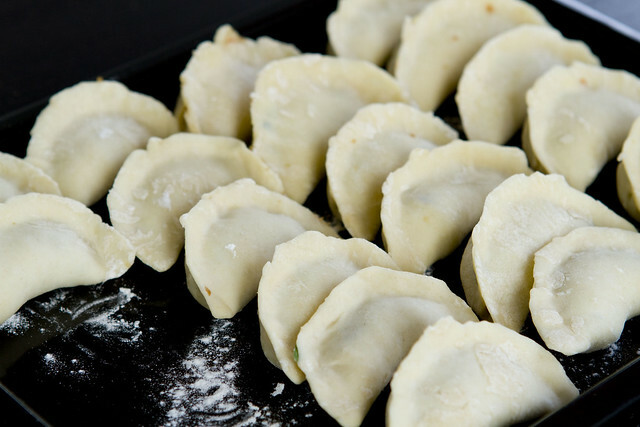 One of the best foods to freeze has got to be dumplings. Both of us love dumplings, particularly the ones with chives. 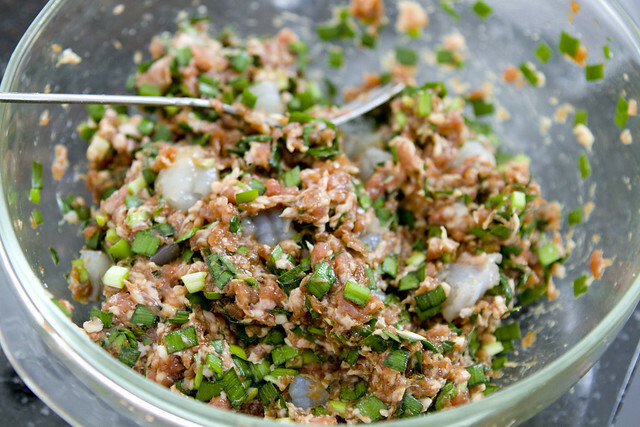 Pork, Shrimp, and Chive is a classic filling and this recipe is how my mom makes it. It has that familiar and comforting flavor I grew up with. I could eat these endlessly. For the dough, I adapted a method from Andrea Nguyen’s book, Asian Dumplings. Intrigued by her use of a food processor (something my mom does not own), her quick method turns out a very nice chewy dough, just the way I like it. For an even quicker method, you can also buy dumpling skins. 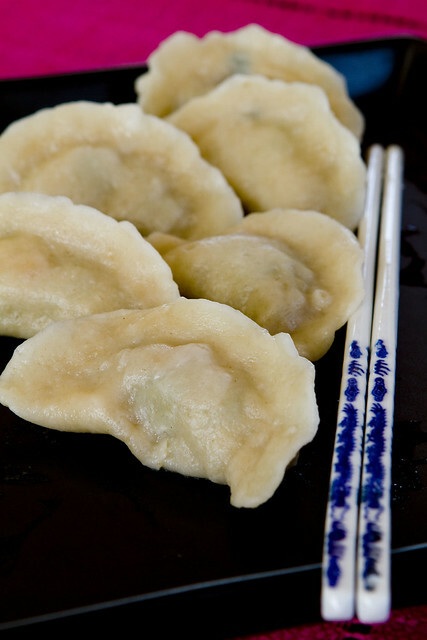 When you make fresh dumplings, it’s hard to resist eating them right away so we polished off about half. That left us with only about two dozen to freeze. Now I wish I made more! 1. Put the flour in a food processor. While the processor is running, pour the hot water in a steady stream through the feed tube. Once all the water is added, stop and check the dough. The dough should feel soft but hold shape when pinched. You can add a teaspoon of water or a tablespoon of flour as necessary. When the dough is right, run the food processor for another 5 to 10 seconds, or until the dough forms a ball. 3. While the dough is resting, you can make the filling. In a large bowl, combine pork, soy sauce, sesame oil, and salt. Stir in chives and shrimp. Cover and refrigerate until dough is ready. 4. When the dough is ready, divide it in half. Place half back in the sealed plastic bag while you work on the first half. Roll the dough into a 1″ diameter log. 5. Cut the log in half, then in half again and again, until that 1″ log makes 24 equal pieces. Keep all of it under a damp paper towel while you work on each dumpling. 7. Place some filling in the center of the dumpling wrapper. You will get a sense of how much to put as you wrap. 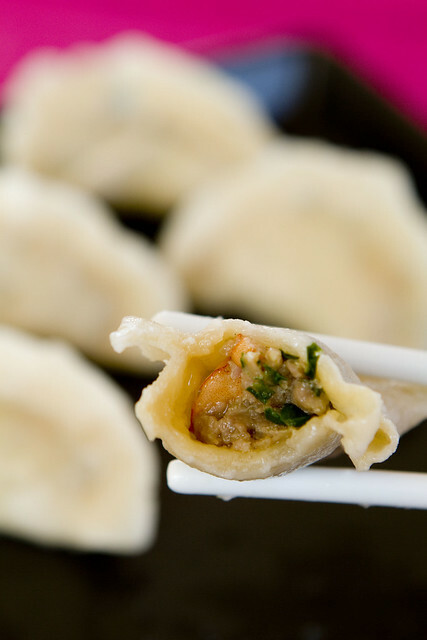 You want the dumplings to be plump but not so full that you have difficulty wrapping. Watch the video for how to wrap the dumpling. There are many methods. This is just one. 8. 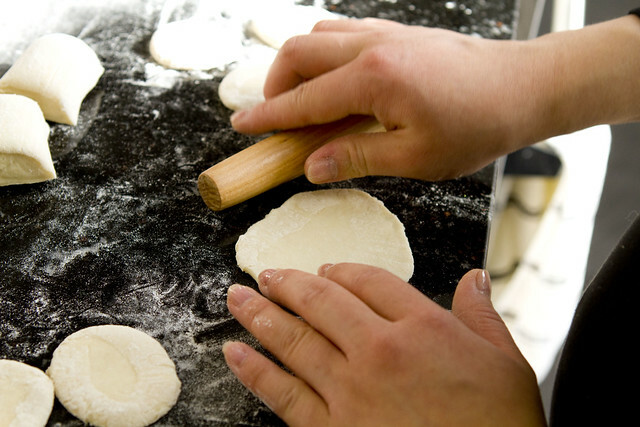 Place wrapped dumplings on a lightly floured tray while you wrap the rest. 9. When you’re done with the first 24 dumplings, you repeat the process with the remaining dough in the sealed plastic bag, making another 24. 10. To cook the dumplings, place them in a large pot of boiling water. Stir for a few seconds. When the water comes back to a boil, add a cup of cold water and allow to come back to a boil. Add another cup of cold water and wait for the water to boil again. 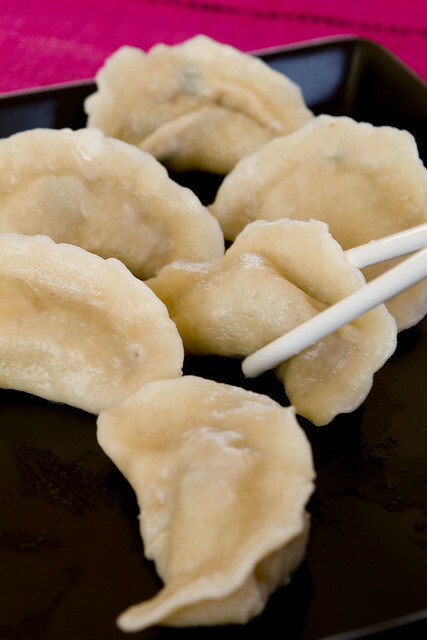 Turn down to a simmer and cook until dumplings are floating. Drain and serve immediately. *Alternatively, you can freeze the dumplings for future use. Freeze the tray of wrapped dumplings for 1 hour. They should now be stiff and you can transfer them to a zipper top freezer bag. When you’re ready to cook, you can cook the same way as before. posted by jessica	at 11:50 AM	Filed under Chinese, Recipes, Video. You can follow any responses to this entry through the RSS 2.0 feed. Both comments and pings are currently closed. This may be a really dumb question, but do you brown the ground pork and cook the shrimp before adding it to the filling? Hi Shannon, not a dumb question! Don’t brown or cook any of the filling before wrapping the dumplings. It all goes in raw and gets cooked when you boil the dumplings. I’ve made/wrapped dumplings and wontons at home, but never made the actual dough! This makes me want to make my own dumpling dough next time. 🙂 Thanks for sharing! we recently had a dumpling making party here in beijing. that combined with your video has convinced me that making my own is completely feasible! Mark, Izzy, and Leah, it makes me so happy to read comments like yours. Making recipes/techniques more approachable is a big goal of mine. I hope you all make the dumplings! Please send me pictures!! Hi Jessica, I wish I were as wise as you are about making food and freezing ahead of time. We as well are not much into takeout. This is a beautiful post!! & yay I can now leave a comment:). Foodwanderings, so glad our spam filter is not filtering out good comments now!! Caya came 9 days early so I really didn’t freeze as much as I would have liked to. I love how simple this recipe looks, not to mention the fact you can freeze it well too. can’t wait to try it out! Looks delicious! I always want to buy those dumpling wrappers when I see them but never knew what to put inside. Now I think I have the opposite problem of too many ideas. Thanks! I was wondering if you know if there is a Wheat/gluten free dumpling wrapper alternative, as I am allergic to wheat. I have found that rice flour can replace wheat flour straight across but don’t know if it will hold up as a wrapper to be boiled. Aside from the soy sauce (which can be purchased gluten free) and the wrap it is wonderful for gluten free diets. Thank you for the post this is one of my favorite dishes.